There is a rumor that the Buckingham Palace has announced that the Queen, Queen Elizabeth II would be paying Duterte a visit immediately to discuss human rights issues and other security matters. According to the press release from the palace, the Queen is much worried of present happenings in the Philippines; lost of lives and people living with fears of bomb attacks. “Philippines needs help. We need to get to their aid. 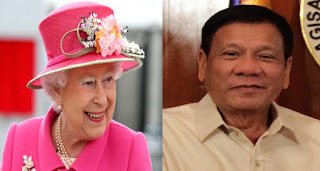 Filipinos have to be protected.” – the release quoted the Queen.